Developed by French physician Michel Pistor in 1952 and widely utilized all over the world, this procedure targets and melts fat by injecting a proprietary blend of phosphatidylcholine, aminophylline, vitamins and minerals into fat-stubborn areas like underarms, love-handles, abdomen, thighs and hips. Multiple treatments are necessary to dissolve fat which will be drained by the lymphatics of the body. Combined with proper diet and exercise, Mesotherapy can produce amazing results with fat reduction of several inches over 3 months. Radiofrequency is a safe, non-invasive aesthetic medical device widely used since 2001 for skin tightening, the reduction of fine lines and wrinkles by stimulating subdermal collagen production and body contouring. Radiofrequency energy delivered to the dermal layer will heat dermis to 41 to 45 degrees C. which will disrupt dermal connective tissues and thereby stimulate new collagen synthesis. The outer skin will be cooled simultaneously in order to lessen the discomfort of heat transmission. This device has proven its efficacy in skin tightening and cellulite reduction and thus its popular application for body contouring in fat-stubborn areas of the abdomen, thighs, love-handles and even under arms. It is the preferred non-surgical solution for facial rejuvenation and skin tightening, providing continued aesthetic improvement months after the procedure by its stimulation of new collagen in the skin. Focused ultrasonic energy delivers precise heating of dermal tissue by direct visualization of all skin layers and non-invasively lifts the deepest layers of the skin by stimulating new collagen synthesis. Since its introduction in 2011, focused ultrasonic rejuvenation of the face can provide non-surgical face lift without any downtime. Focused sound waves will selectively heat up chosen treatment depth up to 70 degrees C. which completely obliterates loose elastin, fibrin, or collagen of old skin and stimulates new production of collagen, giving the treated skin a natural lift over 2-3 months after the procedure. It is the only energy-based device which can safely treat the deepest part of skin for lifting and tightening while bypassing the surface of skin and thus avoiding complications of superficial burns associated with some laser treatments. Focused ultrasonic rejuvenation safely and naturally tightens and lifts skin on the face and neck over time via neocollagenesis. 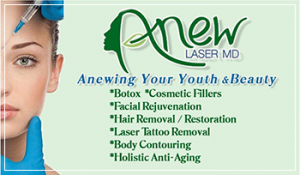 At Anew Laser MD, we proudly serve residents of El Monte to include the communities of Alhambra, Altadena, Anaheim, Arcadia, Artesia, Atwood, Azusa, Baldwin Park, Bell, Bell Gardens, Bellflower, Beverly Hills, Brea, Buena Park, Burbank, Canyon Country, Carson, Cerritos, Chino, Chino Hills, City Of Industry, Claremont, Compton, Covina, Culver City, Cypress, Diamond Bar, Downey, Duarte, El Segundo, Fullerton, Garden Grove, Gardena, Glendale, Glendora, Hacienda Heights, Harbor City, Hawaiian Gardens, Hawthorne, Hermosa Beach, Huntington Beach, Huntington Park, Inglewood, Irvine, La Canada Flintridge, La Crescenta, La Habra, La Mirada, La Palma, La Puente, La Verne, Lakewood, Lawndale, Lomita, Long Beach, Los Alamitos, Los Angeles, Lynwood, Manhattan Beach, Marina Del Rey, Maywood, Midway City, Mission Hills, Monrovia, Montclair. Montebello, Monterey Park, Montrose, Mount Wilson, Mt Baldy, North Hollywood, Norwalk, Ontario, Orange, Pacoima, Palos Verdes Peninsul, Panorama City, Paramount, Pasadena, Pico Rivera, Placentia, Playa Del Rey, Pomona, Rancho Palos Verdes, Redondo Beach, Rosemead, Rowland Heights, San Dimas, San Fernando, San Gabriel, San Marino, San Pedro, Santa Ana, Santa Fe Springs, Santa Monica, Seal Beach, Sherman Oaks, Sierra Madre, Signal Hill, Silverado, South El Monte, South Gate, South Pasadena, Stanton, Studio City, Sun Valley, Sunland, Sunset Beach, Surfside, Sylmar, Temple City, Toluca Lake, Torrance, Tujunga, Tustin, Universal City, Upland, Valley Village, Valyermo, Van Nuys, Venice, Verdugo City, Villa Park, Walnut, West Covina, West Hollywood, Westminster, Whittier, Wilmington, Wrightwood and Yorba Linda among many others!